ETC Group groundbreaking report lifts the lid on the emerging global grab on plants, lands, ecosystems, and traditional cultures. 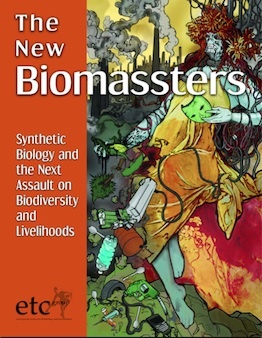 The New Biomassters - Synthetic Biology and the Next Assault on Biodiversity and Livelihoods is a critique of what OECD countries are calling 'the new bioeconomy.' Concerted attempts are already underway to shift industrial production feedstocks from fossil fuels to the 230 billion tones of 'biomass' (living stuff) that the Earth produces every year -not just for liquid fuels but also for production of power, chemicals, plastics and more. Sold as an ecological switch from a ‘black carbon’ (ie fossil) economy to a ‘green carbon’ (plant-based) economy, this emerging bioeconomy is in fact a red-hot resource grab of the lands, livelihoods, knowledge and resources of peoples in the global South, where most of that biomass is located. Enabling the next stage of this new grab is the adoption of synthetic biology techniques (extreme genetic engineering) by a wave of high-tech companies partnering with the world’s largest energy, chemical, forestry and agribusiness corporations. Provides an overview of the bio-based economy being envisioned by many OECD countries and Fortune 500 corporations and being sold to the global South as "clean development," as well as a comprehensive consideration of its wider implications -- a first from civil society. Analyzes the impact of next-generation biofuels, the production of bio-based chemicals and plastics and the industrial burning of biomass for electricity, arguing that civil society needs to critique and confront the combined threats arising from these developments. Unmasks the industrial players intent on commodifying the 76% of terrestrial living material that is not yet incorporated into the global economy. Sectors with an interest in the new bioeconomy (energy, chemical, plastics, food , textiles, pharmaceuticals, carbon trade and forestry industries) flex a combined economic muscle of over US$17 trillion a year. Visible players in the new bioeconomy include BP, Shell, Total, Exxon, Cargill, ADM, Du Pont, BASF, Weyerhaeuser and Syngenta. Explores the safety concerns and threats to livelihoods inherent in the high-risk, game-changing field of synthetic biology. Relying on synthetic biology to provide higher yields and transform sugars could open a Pandora’s box of consequences. See pages 36-41. Surveys the industrial landscape of next generation biofuels, including cellulosic ethanol, algal biofuels, sugar cane, jatropha and synthetic hydrocarbon, and sets out the case for why this next generation is as ecologically and socially dangerous as the first. See pages 43- 50. Poses challenging questions about the 'green' credentials of bio-based plastics and chemicals and their future impact on food supplies and world hunger. See pages 50-56. Raises important political questions about land grabbing: 86% of global biomass is located in the tropics and subtropics, a simple fact driving an industrial grab that threatens to accelerate the pace of forest destruction and land acquisition in the South in order to feed the economies of the North. See pages 15-18. Tallies the investments, subsidies and financial promises being made for the biomass economy. Predictions for the market value of biomass-based goods and services total five hundred billion dollars by 2020, with the biggest turnover expected in biofuels and biomass electricity. See pages 13-14. Challenges common myths of industrial biomass use, including the claims that switching to biomass is carbon-neutral, renewable and green. In fact, burning biomass can often produce more CO2 per energy unit than burning coal. See pages 19-20. Details how a key error in the UN climate convention is driving destructive policies. By considering biomass energy as ‘carbon neutral,’ the UN has enabled destructive national renewables policies, carbon trading, and technology transfer activities. This report also examines the new REDD+ provisions in the context of the biomass economy. See pages 20- 24. Sets out why we cannot afford any increase in the amount of biomass taken from already overstressed ecosystems. Indeed, industrial civilization may already be taking too much biomass from the systems we depend upon. See pages 24- 26. Explores the new suite of technological strategies being proposed by biomass advocates to boost global stocks of biomass, including the genetic engineering of crops, trees and algae. Meanwhile, the geoengineering agenda is increasingly converging on biomass. See pages 27-30. Exposes the switch to algae, purported to be the next 'clean green' feedstock and argues the case against industrial algal production. See pages 47-50.